Clark the Carver has been crafting unique carvings using his chainsaws to carve a variety of art. 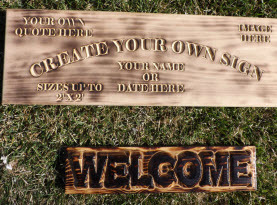 From animals to totems to welcome signs and furniture, Carve Me A Bear! 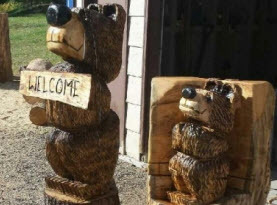 Chainsaw Carvings provide custom chainsaw carvings to the Las Vegas, NV locals, and when the scorching temperatures rise, Clark the Carver works from Montana. Since 1986 Clark the Carver has been creating stunning carvings; turning clumps of wood into remarkable sculptures. Among the many talented likenesses he creates, birds in their variety are carved from wood with nothing but a chainsaw and some other special tools. Birds created by Carve Me A Bear! Chainsaw Carvings include; parrots, roosters, hens, owls, and eagles. Many people are partial to the beauty, freedom and majesty various birds have to offer. Some are avid bird watchers and others can’t get enough of their favorite bird themed merchandise. Eagles are depicted as symbols of freedom and power and so suiting for our National bird. Eagles are often admired all over the globe, but in the U.S. the eagle is frequently used to proudly display our nation’s pride. Eagles are beautiful, large, and yet still graceful and powerful. Intriguing the old and young, eagles are a popular favorite bird. Carve Me A Bear! Chainsaw Carvings can custom design your eagle carving ready to take flight to capture their natural elegance and display your American roots. Chickens are not only entertaining to watch in the yard, or take advantage of fresh laid eggs, or even the benefits of pest control, but some collect the wide range of breeds. With amazing features and colors both roosters and hens are popular to quite a few people. There are over 60 breeds of chickens; some breeds are more common where other breeds are prized beauties featured in shows and contests. Egg laying chicken breeds are plentiful; Ameraucana, Barnevelder, Dominique, and Lakenvelder are just a handful of beauties that lay eggs for people looking to stay away from hormone and chemically fed chickens. Show chickens are quite a hobby for quite a few folks. Showcasing their pampered treasures to like minded people is conquered in events. Brahma, Cochin, Houdan, and Old English Game are just a small handful of unique breeds that are used in shows. To honor your favorite egg laying chicken or spectacular show breed, Clark the Carver of Carve Me A Bear! Chainsaw Carvings can transform a stump of wood into any of these breeds that attract your attention! Parrots have several breeds as well. Playful and exotic pets, parrots are known to be the best friend of many pet owners. Their natural curiosity and talents for repeating words and songs make parrots a beloved bird to many Las Vegas locals. Parrots feature brightly colored feathers, and are one of the more intelligent fowls roaming the land and sky. Many parrot species live for 80 years, making them a wonderful companion. For those that can’t get enough of parrots, Carve Me A Bear! Chainsaw Carvings and Clark the Carver can design your favorite parrot carving to adorn your home or landscape. There are about 200 species of owls. They are recognized by their upright stance, large, broad head with flat face and round eyes. Let us not forget their powerful talons and effective hooked beaks. Owls are nocturnal carnivorous birds of prey with a hunting strategy mainly of stealth and surprise. In Ancient European and modern Western cultures, owls are associated with wisdom. The Pawnee Native American tribes traditionally viewed owls as the symbol of protection from any danger within their realm while Pueblo people associated owls with Skeleton Man; the god of death and spirit of fertility. No matter the bird or other creature you seem to favor, Clark the Carver of Carve Me A Bear! Chainsaw Carvings can carve your favorite with his trusty chainsaws. 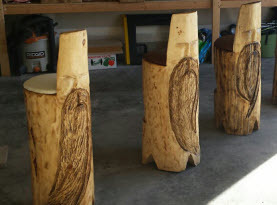 Have an old stump in your yard? 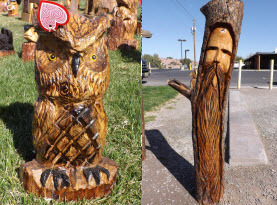 Instead of paying steep fees to have it professionally removed, instead enlist Clark the Carver to sculpt your favorite birds or even animal into the stump, turning the eye sore into a masterpiece. Call us today!